Berwick is a great base for anyone wishing to explore the hills and coast of north Northumberland and the Scottish Borders on foot. 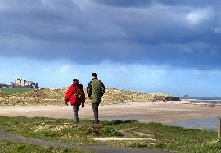 A walk of about one and a quarter miles around Berwick’s unique circuit of Elizabethan ramparts and bastions offers panoramic views of the historic townscape, the Northumberland coast and the surrounding countryside. From the town centre there are lovely walks on either side of the River Tweed, across the Border along the rocky Berwickshire coast, or southwards to the beaches at Spittal and Cocklawburn and on to Holy Island or beyond. You need travel only a few miles by car, bus or bicycle to enjoy the peaceful solitude of the Cheviot Hills, or the sandy beaches and dunes along the Northumberland Heritage Coast. You can often walk for miles before you meet anyone else, alone with the sound of the breeze and the wild birds.